Sure, I may not be the most emotional person and I have a pretty high tolerance of pain. Heck, I snapped my arm in half last year and didn’t shed a tear. I went through child birth without even raising my voice. I have, however, been known to cry. May of these sob sessions have happened right at Disney World, and no they weren’t because wait times for Splash Mountain were over 90 minutes! 1. 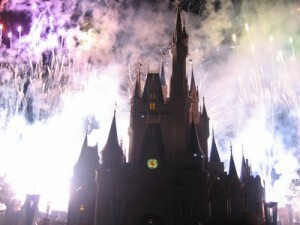 The Magic Kingdom Opening Ceremony. Yup, the whole zip a dee doo dah, Casey Junior Coming Down the Tracks deal. It gets me every single time. The moment Mickey gets off the train and the crowd goes wild, yeah, forget about it I’m a blubbering fool by then. Pass me my sunglasses. 2. Wishes. Start light star bright first star I see tonight. The second I hear that little voice I am done for. By the grand finale I am sobbing. I don’t know why this is! I start out just tearing up. When Tinkerbell makes her entrance I feel tears running down my cheeks, and gosh darnit when that little girl sings I am a gonner! Luckily its dark out so nobody can tell I look Cinderella after her stepsisters have raked her over the coals. Ok, to be fair, I would be happy to look like Cindy on a bad day. Oh well, moving on! 3. Seeing kids get really excited about the characters. I remember seeing Chip and Dale come from backstage at Epcot. They were headed over to their meet and greet area. Before they arrived a little boy who could not contain his excitement ran for them, hugging Chips leg like it was the best thing in the world to see the life sized chipmunks. I was so happy for him I sprung a leak. Lame, maybe, but It was really sweet! 4. The Magical Express Going Home Video. I love that there is entertainment on the bus to Orlando International, but does the end always have to make me cry. When Mickey and his pals get together to sing that famous “Now its time to say goodbye to all our company,” Yup I lose it. Its embarrassing actually. I really feel like they are going to miss me as much as I am going to miss them. I don’t know, maybe its just my money they will be missing, but it feels real! 5. This brings me to my final thing that makes me cry; getting the bill. We had a grand old time, but it never softens the blow of those room charges! In fairness this is probably the thing that makes my husband cry more than me, but its still a really emotional moment. But, you know what? We pay it off and start planning another trip because in our busy day to day lives sharing a few days together at Disney is well worth the price! This entry was posted in My thoughts, Top Five, Uncategorized. Bookmark the permalink. I don’t know exactly why, but I have aywals enjoyed seeing that elephant and the musicians on him in It’s a Small World. Maybe it is because I like the music in that part of the ride. Nice to see him here!